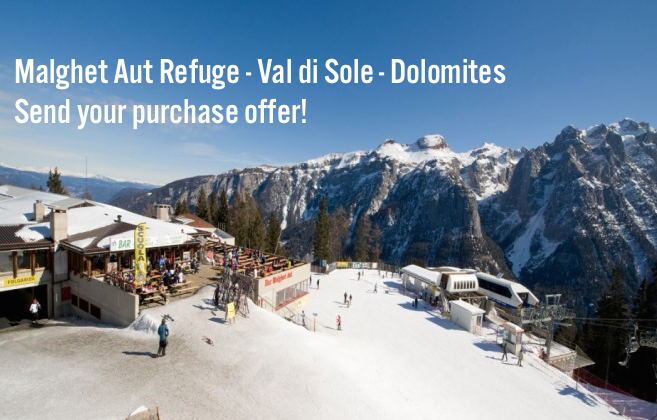 It is possibile to send purchase offers for Malghet Aut Refuge, located at 1861 mt, on one of the most prestigious stations of the ski district Folgarida , Marileva, Madonna di Campiglio. The context is the Val di Sole , one of the most beautifiul valleys of Trentino, a highly touristic area , rich in natural and cultural attractions. About 30% of 9.000.000 yearly passages on the plants of Folgarida Marilleva district crosses the area in front of the refuge, specifically , a total amount of 2.751.291 passages in 2013/2014 season. Until 30/06/2015 it will be possibile to send purchase offers on the property which consists of Bar restaurant and related services included in Folgarida Malghet Aut (Dimaro- Trento) cablecar top station. Register to the website and download the participation form by clicking on the related button in order to send the purchase offer. For further details please check the informative brochure and appraisal attached in the referring webpage.